This post combines the bibliographical notes for 2015’s first CamCREES seminar – Dr Kristin Roth-Ey’s talk on non-Soviet radio (and particularly Seva Novgorodsev’s BBC programmes) broadcast into the USSR – with January’s Slavonic item of the month, Namedni, illustrated guides to international and domestic developments, in various fields, particularly significant to the 1946-2010 Soviet/Russian population. This term, the CamCREES seminars are linked by the theme of Russian and Soviet mass culture. In the first seminar of 2015, Dr Roth-Ey of UCL SSEES spoke about Soviet audiences of targeted non-Soviet radio programmes. Listening to such broadcasts was not straightforward – frequencies were sometimes officially jammed, for example (examples of jamming noises were played from http://radiojamming.info/), and coverage was unreliable. Of the many stations and programmes which broadcast into the Soviet Union, Dr Roth-Ey focused in particular on the BBC shows of the Russian émigré Seva Novgorodsev (his preferred spelling, which I use throughout this post; more standard transliteration from the Russian would be Novgorodtsev). These are known mainly by the name Rok-posevy, one of various titles of his broadcast over the years. While national stations played “approved” music, Novgorodsev introduced his vast audiences to all kinds of groups from the West. Another major part of the appeal of Rok-posevy was the presenter himself. Soviet presenters were trained to be uniform in their calm and contained diction; Novgorodsev capitalised on being able to convey his personality. His was a much more personal connection with his audience, and he standardly read fan mail received from the USSR out on air and played requests. He received thousands upon thousands of letters from fans, but reportedly estimated that this represented only a fraction of the whole. Many correspondents, having guessed that their earlier letters had not made it out of the country, took to noting in their correspondence what number “attempt” the letter in hand was. Dr Roth-Ey talked about the strange three-way interaction which existed between Novgorodsev, his audience, and the Soviet authorities (represented in postal censorship or radio jamming). A vast quantity of the letters Novgorodsev received are now held by the Hoover Institution Archives, although sadly many years are unrepresented, through loss of the letters. No letters are available online, but an inventory of the collection is linked to here. In the University Library, we have two books by Novgorodsev, both in Russian. The first book is Ostorozhno, liudi! (Look out, people!, C201.d.2495), the initial volume of his “chronicle of morals” made up of anecdotes and reflections; a second volume is currently on order. 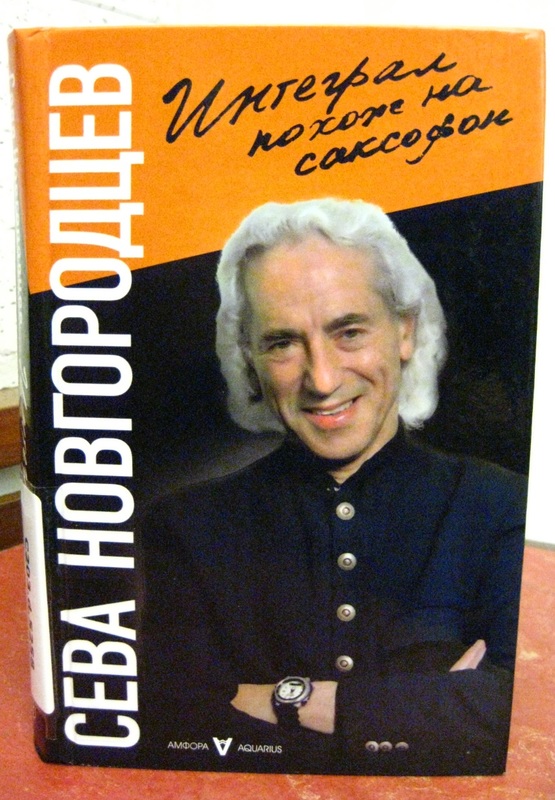 The other book by Novgorodsev currently held is his 2011 autobiography, Integral pokhozh na saksofon (An integral resembling a saxophone; C203.d.5258), which covers his life before emigration, including his career as a saxophionist. Dr Roth-Ey’s 2011 book Moscow prime time : how the Soviet Union built the media empire that lost the cultural Cold War, in which she explores Soviet policy on mass media, stands in the Library’s collections at C209.c.1593. Novgorodsev has a couple of links to the January item of the month. He appeared in a 1991 edition of the television programme Namedni (Recently); a recording of it is, at the time of writing, available here. Namedni ran on and off during the 1990s and 2000s, and its focus changed in that time. In the early days, when Novgorodsev was interviewed in his BBC studio, Namedni looked at events and news from the previous few days. Later, it was given the subtitle “our era” and took on a more historical bent, with each programme devoted to significant international and domestic moments in a given period of post-WWII history; it eventually covered the years 1961 to 2003. Since the last broadcast in 2003, its presenter through both manifestations, the journalist Leonid Parfenov, has produced books of Namedni, expanding on the programmes not only in terms of the period covered (to date, this stretches from 1946 to 2010) but also in terms of the number of subjects looked at in each year. The Library’s set of Namedni volumes published to date (covering 1946-2010). Novgorodsev appears in the 1975 book, in a section called Vrazh’i golosa (Enemy voices). His appearance in this year, two years before his BBC career actually started, is explained by the fact that the section follows on in subject from the previous one, which looked at the Helsinki Accords signed by Brezhnev, among others, that year. The Enemy voices section starts by saying that the agreement included commitments to freer access to information and saw a temporary cessation in the jamming of radio frequencies in Soviet cities (smaller towns and the countryside were never the target). The main body of the section talks about the influence of Western radio programmes and the BBC in particular. The BBC’s Anatolii Maksimovich Gold’berg attracted the political listener, Parfenov writes, while Seva Novgorodsev attracted the apolitical. The Namedni books follow a very set pattern, as the picture above of the set in the University Library shows. The standard image of Parfenov being broadcast on a television set appropriate to the period (the 2005-2010 set is instead a tablet computer) is a nod to the format of the television programme, which saw Parfenov slotted into historical footage. The books essentially provide a largely colour-illustrated chronological list of the events and developments which made an impression on the Soviet people, from international events to domestic products. If we take the list for 1975, for example, we can see an extraordinary range of subjects. Among these are: the launch of the Russian-langauge gameshow “What? Where? When?”, war in Laos and Cambodia, the Soiuz-Apollo mission, the rise of the singer Alla Pugacheva, the OPEC siege in Vienna, Sakharov’s Nobel prize, and the electric samovar. Due to the books’ size and heavily illustrated content, they have all been put in the S950 class and must therefore be consulted only in the Library’s West Room. Here is a list of their entries in the catalogue. This entry was posted in New Acquisitions, Russian, Slavonic and tagged media by europeancollections. Bookmark the permalink.